Before I get too much farther into this post I wanted to remind you that I'll be appearing on the Don't Make This Weird podcast on September 7th at 8 pm EST. Check out their Facebook Page and YouTube Channel for updates! So about this shake, a couple weeks ago on social media I asked about what plant-based proteins you all liked and used and I got some great feedback. For the most part the response I got suggested the Vega brand, so I thought I would give it a shot! 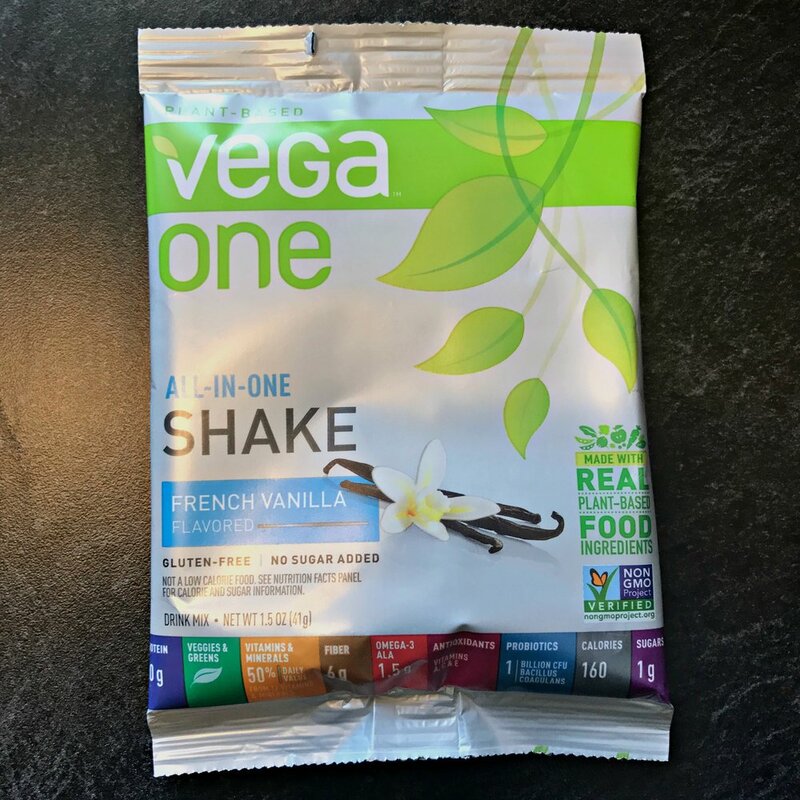 I tried a couple different sample packs of the Vega protein and the one I liked the best was the All-in-One shake in the French Vanilla flavor. The reason I liked this shake was because it gave me a little bit of everything. This protein had a veggies and greens blend (not too worried about this as I include broccoli sprouts and Power Greens in my shakes), a good amount of protein per serving, probiotics (can never have enough), Omega-3s (yay fatty acids! ), additional vitamins and minerals, fiber, and NO ADDED SUGAR! The vanilla flavor was a plus because it helped cover up the flavor of the broccoli sprouts (healthy isn't always so tasty). If you're looking for a plant-based protein I do approve of this one as far as content and flavor. If you're looking for a SUPER PACKED green protein shake, look no more. Check out this simple recipe! As I mentioned I used the Vega One All-in-One powder in the French Vanilla flavor. The vanilla flavor of the shake plus the strawberries make this shake a little more tolerable in the taste category. As I mentioned, the broccoli sprouts are the kicker here when it comes to the taste category, BUT there also an important ingredient as far as nutrients and phytochemicals, so they gotta stay. If you're not familiar with broccoli sprouts, be on the look out for my next post on how to grow them and their benefits! So after you've cut and measured all of your ingredients, throw it all into your blender. This is no "sweet" shake, but it is filled with nutrients and still has a pretty good taste! Share your favorite recipes in the comments!